with the exception of the Shar-Pei which are the largest of the puppies at 7" (17.5 cm) and hand painted by the artist. 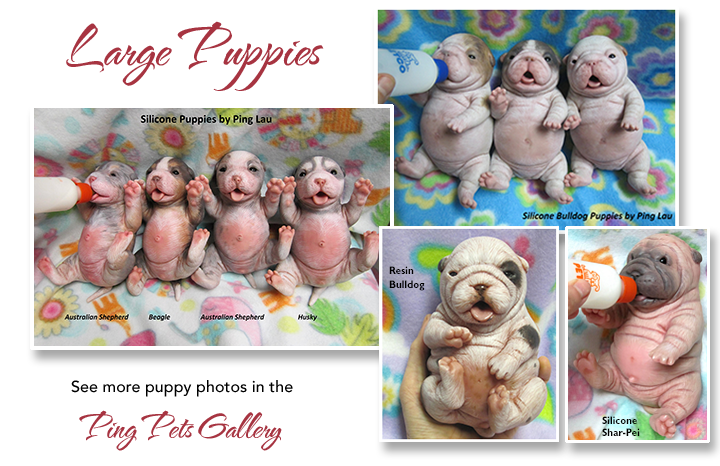 When ordering, a deposit of $75 USD is due ($95 USD for Shar-Pei, $55 USD for resin) with the balance payable when your pet is ready. Postage is free in the U.S.; $20 USD First-Class Postage to Canada; $39 USD Registered First Class to the rest of the world. English Bulldog, Shar-Pei, Labrador, Australian Shepherd, Beagle, Husky, or Pit Bull. Or request custom painting to resemble the large breed of your choice.